Our granule-sized pellets are a perfect fit for your finch and can be offered as a full meal or as an important part of your finch’s diet. 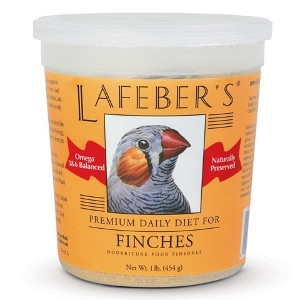 Many finches owners have found that their birds love a combination of high-quality seed in addition to their pellets, as well as millet spray and a variety of fresh fruits and vegetables. When you pour a parrot seed mix into your macaw or cockatoo’s bowl, you might notice that he picks out his favorites, often peanuts or sunflower seeds — not the healthiest choices. While seed is fine as a snack, your macaw or cockatoo’s main meal needs to pack more of a nutritional punch. 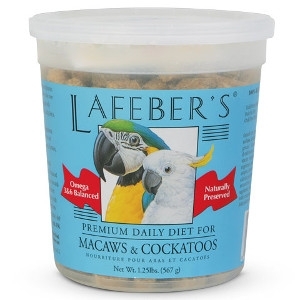 We created Lafeber’s Premium Daily Diet to ensure your parrot gets all the nutrients he needs for a full, energetic and healthy life, with a taste he’ll find too good to pass up. 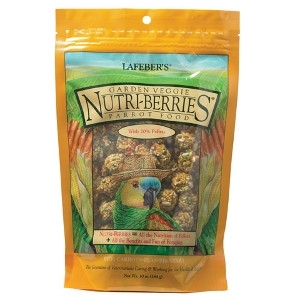 Tropical Fruit Nutri-Berries for Macaws combine whole seeds and grains with real pieces of pineapple, papaya and mango, along with 26% pellets to give your bird balanced nutrition without sacrificing taste or texture. 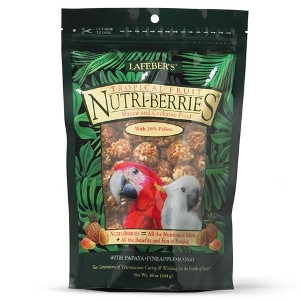 All of these wholesome ingredients are rolled together in a berry shape perfectly sized for your macaw or cockatoo to hold in his foot so he can relish each bite.